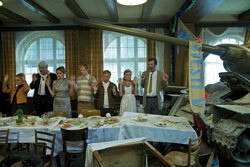 PGE Cinema * Friday (August 7, 2009) * 7:30 p.m.
Operation Danube, Poland-Czech Republic (PL-CZ) 2009, colour, 104 min. Tragicomedy, which takes place during Warsaw Pact invasion of Czechoslovakia, 1968. Crew of a Polish tank named “Little Ladybird” gets lost during fights. Its members end up in a Czech border town, where tank “parks” in the local inn. Director and manager of the theatre. Since 1994 manager of the Helena Modrzejewska Theatre in Legnica. “Operation Danube” is his film debut.